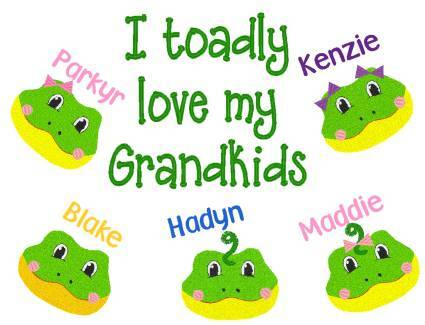 These cute little frogs make an adorable Grandparent shirt! You choose from T-shirt, long-sleeved T-shirt, or sweatshirt in white or grey in sizes Medium-2X. Please specify Grandkid's names that will be embroidered in complimentary colors. 1-5 kid's names included. Extra charge for additional names.